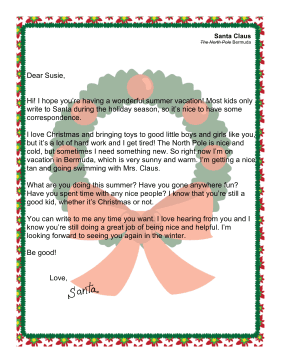 Kids wondering what Santa does in July can get this vacation update letter. Hi! I hope you're having a wonderful summer vacation! Most kids only write to Santa during the holiday season, so it's nice to have some correspondence. I love Christmas and bringing toys to good little boys and girls like you, but it's a lot of hard work and I get tired! The North Pole is nice and cold, but sometimes I need something new. So right now I'm on vacation in Bermuda, which is very sunny and warm. I'm getting a nice tan and going swimming with Mrs. Claus. What are you doing this summer? Have you gone anywhere fun? Have you spent time with any nice people? I know that you're still a good kid, whether it's Christmas or not. You can write to me any time you want. I love hearing from you and I know you're still doing a great job of being nice and helpful. I'm looking forward to seeing you again in the winter.